On May 21st Terry Zee Lee, the director of Sky Wind World, Inc. based out of Billings, Montana, began hanging kites in businesses throughout Salmon. The kites are various shapes and sizes but each one depicts something from of the Lewis and Clark Expedition. 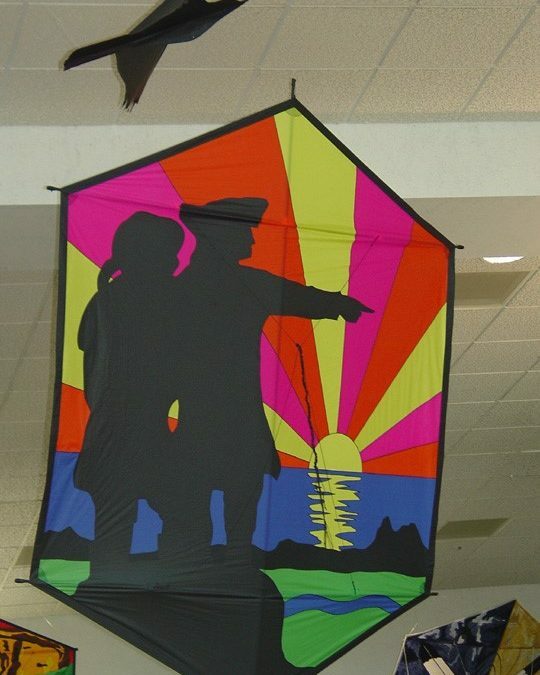 For example, the Salmon Public Library is hosting a kite titled, ” ‘Pablo’…In Honor of the Bears” which represents the numerous run-ins the Expedition had with grizzly bear as they made their way west. On May 6, 1805 Captain Lewis wrote, “I find the curiosity of our party is pretty well satisfied with respect to this animal…the formidable appearance of the male bear killed on the 5th, plus the difficulty with which they die, has staggered the resolution of several [of the men]…Capt. Clark and Drouillard killed the largest brown bear this evening which we have yet seen…a most tremendous looking animal.He measured 8’7″ from nose to hind foot…” This is just one example. There are 25 kites hanging in 17 locations all over town. “Terry told me it would be hard to explain the display to people, and she was right. Telling folks we wanted to hang over twenty kites around town, I got a lot of puzzled looks. When the first one went up this week I got excited. They are big, bold colors, and each one really draws you in and the second you see one you’ll get it. My favorites are the kites with really long tails,” said Lin Gray, director of the Sacajawea Center and grant writer for the display. Three entities awarded the Sacajawea Center funds to pay for the exhibit to come to town: the Idaho Commission on the Arts, the Idaho Humanities Council, and City of Salmon’s Local Option Tax fund. A kite tour brochure has been created to direct folks to each location and provide a little information about the design of the kites. The kites will be on display through Labor Day and when Ms. Lee returns to take them down the kites will be flown for the community. Part of the project includes creating a new kite that represents the time the Lewis and Clark Expedition spent in Lemhi County from August 12 – September 3, 1805. Derek “No-Sun” Brown, a member of the Shoshone-Bannock Tribe and a graduate of the Institute of American Indian Arts painted the image. Brown notes, “The scene I depicted is meant to capture multiple events – when Sacajawea meets her long lost brother and when he gives Lewis and Clark a tipi to sleep in for the night. In the tipi are Sacajawea, baby, Lewis, Clark, the dog, and two tribal members all sitting and talking by the warm fire. The river and agai dika (salmon shaped silver strokes) are more, representations.” The painting is currently being turned into a kite by kite builder, Steve Drake. When it is complete it will be hung in Salmon and then added to the display that travels all over the country. 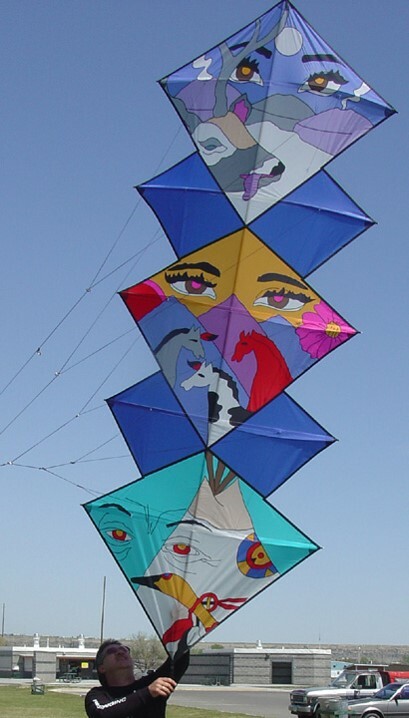 To view the kites at the Sacajawea Center and pick up a brochure so you can find them all visit the Interpretive Center. It is open daily and admission is $5 per person or $12 per family. Lemhi County residents enter the park for free.